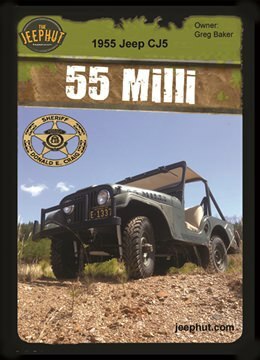 Milli is a 1955 CJ5, the first year of the CJ5. Purchased by the JeepHut in 2009 from a barn in North Georgia she was all original, including the rust holes. In 2012 she was handed over to Greg Baker as a mascot for the Picken’s Georgia Sheriff’s JeepFest. Given her age, Mr. Baker thought she would be a perfect fit to show the timeless tradition of Jeeps. Look for Milli at the next Sheriff’s Jeepfest.